The ultra -wide monitors take some time to surprise us by format and performance, and now there is a manufacturer who has taken the concept to offer an All-in-One also highlighted by the curved design of the screen. The HP Envy 34 Curved is a team that surprises from the first moment that these dimensions and design, and have had the opportunity to study it in detail. Is the All-in-One ultra -wide sense? It’s what we reveal in our analysis. It’s hard not to be attracted by the ultra-panoramic, curved design of the HP screen: exterior finish is spectacular, with two large speakers bands beside the screen – what makes it even larger- and a black frame on the front contrasts with the rear in which dominates the pearl white. It is an ultra – thin monitor, but it’s clear, is not only a monitor: the All-in-One HP integrates within various components that make its thickness, especially in the central part of the curve, is remarkable, but make those lines even with this handicap the team aspect is impressive. There are some outstanding notes that design, like the ability to slightly tilt the screen to adjust the viewing angle. This allows balancing the fact that the screen, at least in our first impressions, is located at a somewhat low altitude. That forces to look down at times, something that could be solved with a height adjustment which unfortunately does not have. The solution, of course, is to put this screen on an additional support at the table to adjust the height to which we “face” to the screen. The design also offers some questionable decisions: probably a wise move to place the headphone port at the bottom of the screen, but do the same with the card reader or two additional USB 3.0 is more debatable. In fact, we wanted that these ports will be located on one side, but HP have preferred to take advantage of the lower edge, where we also find the controls of the monitor – and, of course, the back of the screen. This is where we find the Gigabit Ethernet port flanked by USB (2 USB 2.0, 2 USB 3.0) ports, and a pleasant surprise: the fact that in addition to the HDMI output if we wished-for connecting an external – monitor port also have an HDMI input port to tap the screen to connect other video sources. This function is very interesting, although we would have liked also have a Display Port also a standard increasingly accepted in the industry and it would have been the perfect complement to make fully effective the dual role as the monitor of any of our devices. The outstanding feature of this team is undoubtedly its IPS screen with that resolution 34 – inch 3,440 x 1,440 pixels of and the 21:9 format ultra-panoramic. HP makers indicate that this -Care screen is not touch, that would be remarkable and provides 99% of the sRGB color gamut and also has the Technicolor certification, which theoretically guarantees that see the colors in the same way in which they were originally conceived for the content displayed on the screen. These dimensions allow space available to integrate components with some freedom, but as in any other All-in-One that price, we have a locked laptop on a monitor. That starts being noticed on the processor Intel Core i7-6700T with a TDP of 35W that clearly aimed at this type of machine, but there are many indications that make us assume that this is not a desktop computer to use, but well before a powerful laptop. The most important are probably that affects the graphic capability. This screen resolution is governed by two chips: the first, the GPU which integrates Intel SoC. That is an Intel HD Graphics 530 that certainly applies to work and enjoy multimedia content, but fall short in demanding games. Precisely his aid comes integrated by HP on the computer we tested option: an NVIDIA GeForce GTX 960A, a special version of that model intended for this OEM particular allowed to enjoy a decent but not suitable for demanding gamers performance. The storage section is properly resolved thanks to the inclusion of an SSD of 128 GB which allows the system and applications are launched and run smoothly and fluidly. In case you need more space, HP also integrates a hard drive of 1TB which surprised us not to be the so oriented portable industry as we thought (7,200 RPM in this unit include 2.5-inch SATA600 interface). SSD (one SamsungMZHPV128HDGM PCIe M.2 format) saves the papers if we need brutal transfer speeds while if there we need capacity unit HGST, a subsidiary of Western Digital. Two drawbacks here: first, that HP have decided not to provide users “to queue teen” the team on their own and make their own changes, so any component update is complex unless one has experience and the right tools. The second that contrary to what happens with its curved monitor -HP Envy 34c, which is the only screen- not be able to access a mode PiP (Picture-in-Picture) with which to display two video inputs simultaneously split screen. The main advantage of having a team working with this resolution is that we have a really large area in which to distribute our windows. Here the combinations are numerous, and almost split screen mode that falls short diagonal screen. In fact, we prefer to use the screen – thirds or sixths: it is a pity that HP does not provide a specific utility to make the most of this orientation. The team tries some sort of tiling window manager, very typical for Linux distributions, but here we have convenient solutions within our reach. This is the case of WinSplit Revolution, which makes it easy to place screens in different proportions and locations, and so make the most of the work area. Those 3,440 x 1,440 pixels go far and is a pleasure to put windows thirds for different content or even split any of these fractions in half to have a configuration with multiple windows in which at any time can enjoy their content No problem. What is a reality for all applications is not so much for the video: today there are few contents that leverage content natively 21:9. On YouTube, for example, you may find some trailers and videos in this format but are the least. Here it is clear that the standard is the “conventional” widescreen with 16: 9 makes, at least, appear black bars on the sides of the reproduced content, something that detracts from that play a bit. Although there are extensions for browsers that resizes those videos and adjust aspect ratios (Netflix Ultra wide Display Support and Black Bars Be was gone are two examples for Chrome), this operation is usually done at the expense of cutting the video resolution or some of the areas which that content is displayed. To prevent content from other sources can also be given this problem, although there are players that make scaling and proper adjustment of these videos. The abandoned ArcSoft Total Media Theatre is one of the most popular among users of this format monitors that good content to fit 21: 9 format, although some go to other players. A good example is VLC with which you can try to force the aspect ratio or end up making a crop (and no zoom) of the image to avoid annoying black bars. The tips when trying to make the most of these video content are varied, so here it is to find the combination that best appeals to each user. We, for example, we tested player options Open Source MPC-HC and we adjust those contents without too much trouble getting a fantastic result. It is that HP does not include any option to facilitate this task? Yes, it does: the team comes with a trial version of Cyberlink PowerDirector, with which we can for instance zoom in on the video – losing information, logically, to play such content without black bands. Even the native Windows player may help in this task. In that video playback, it is true that we have the help of this powerful system 6 front speakers (4 in the case of the models of 23.8 and 27 inches) developed by Bang & Olufsen sound and very decently in various situations. In our tests with different video and audio content, we could enjoy a remarkable sound quality benefits once again the dimensions of this team and especially of those sidebands exclusively for this facet. The presence of the black bands not only occurs in video content, but also does it in games, but fortunately much less sharply. In relatively recent titles is likely that these modes 21:9 are supported natively, but for giving some problems there are potential solutions. As explained in PCMonitors, many modern games take advantage of the so -called Hor +, a mode that lets you scale the field of view (Field of View or FOV) to suit these ultra-panoramic resolutions and thus enjoy these titles as it should be: more information is displayed in the horizontal, and the same in the vertical. In others are developers who can support these resolutions by patches that correct these errors, but even in the absence of patches can always try solutions like those cited in PC Gamer: systems like Flawless Widescreen or Windows Borderless Gaming allow just use those games full screen without loss of resolution or quality, simply taking advantage of that extra area, yes, will impose an additional burden on the computer. What is clear is that the result is worth it, with a more immersive experience that gains, even more, whole thanks to the curvature of the screen. There is a reference forum on this topic, WideScreen Gaming Forum that will solve your doubts in this regard. The graphics power of the equipment is for these remarkable but not exceptional cases, so enjoy a high level of detail with these resolutions demanding games will be rather difficult. We tried a couple of titles – ‘Dirt Rally’ and ‘Crysis’- and check how to enjoy these games with good quality – but not at the highest level of detail- on this screen was an absolute blast. When trying to evaluate the performance of this team we faced, as usual, to doubts whether to refer desktops or desktops. To these synthetic tests which joined make to storage units. Here was clear the difference between the SSD, which according to CrystalDiskMark managed 1.986 and 436.4 MB / s in sequential read and write respectively, and the hard drive of 1TB, with 144.3 and 137.7 that obtained MB / s respectively in the same tests. The difference is evident, especially in readings. Here it should be mentioned a section which is also important for many users: the noise level generated by the HP Envy Curved 34 is usually very low, but things change if we enjoyed a game or take the opportunity to work with some demanding application. In such cases the ventilation equipment into action in a sensitive and a buzz that appears without being overwhelming yes it can become annoying. On the front of the screen, we find the Intel RealSense3D camera with a sensor 2 Mpixels which according to the manufacturer is capable of recording videos at 1080p. This camera is what makes possible the identification via Windows Hello, the biometric authentication system that authenticates the session using facial recognition, without passwords. This type of system takes a lot of sense in this team that we always use that camera “staring into the face” and saves us the traditional method of authentication based on username and password. It is also necessary to mention the presence of a wireless keyboard and mouse included with the small USB key that serves as a wireless receiver for these devices. The mouse is acceptable, but the keyboard detracts a little whole. HP wanted to offer here too compact and no spaces available to save size, when it is assumed that this is a desktop that certainly does not skimp on its diagonal screen. If you were counting with a mouse and keyboard of your taste you are likely to keep preface use before using those provided by HP. This team is governed by the 64 – bit edition of Windows 10 Home, and although we cannot make use of touch support this operating system as we said the screen is prodigious but does not reach there – yes we have seen as support resolution of teamwork is perfect. In the offer, there are some own software HP utilities. One of the highlights is HP My Display, which allows you to set basic parameters such as monitor mode – predetermined work, ‘Technicolor’ text and games-, brightness, contrast and volume or set the white point (sRGB, Hot and fresh). This is a basic utility and a somewhat rough interface that nevertheless allows easy access to these default modes. We miss, yes, a way to save custom configurations and access a finer control monitor options, but it is certainly useful for those basic parameters. Beyond that we have HP Lounge, the alternatives own this manufacturer Spotify, or HP Recovery Manager, with which we can install drivers, restore the system or create recovery media, among other things. Unfortunately, also, we found some bloatware, for example, present through the application of TripAdvisor games like Candy Crush Soda Saga or advertising links on the Start menu tiles. We also have the trial version of the suite antivirus McAfee LifeSafe, a classic and among many manufacturers are still coming to terms with this and other developers of security solutions that users simply do not ask. Nothing particularly serious, but confirms that trend remains one of the evils of the industry. 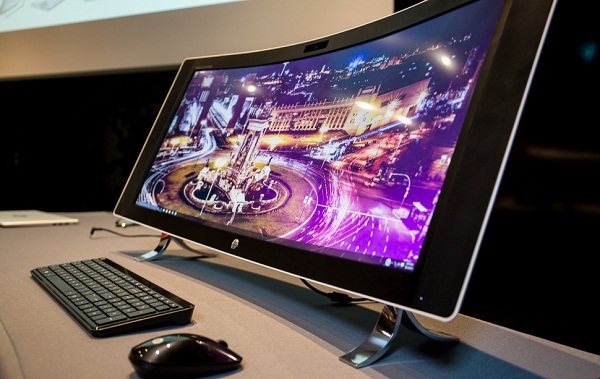 The HP Envy 34 meets Curved shape than enough in two of those three scenarios. The work area gives a huge margin to (try to) be more productive, and certainly this format helps video content, especially those with 21:9 format native, who are not many- shine with their own light. It gets more complicated in the field of games. The dedicated graphics help, but not demanding titles that will test the GPU to these resolutions. At this point, it is difficult to recommend this team, and in our opinion is more advisable to buy a ULTRAPANORAMIC screen just be the screen (or bet on a multi monitor configuration) and connect it to a PC prepared for these scenarios. In the other scenario, we will have a valuable ally in all kinds of tasks although the HP Envy 34 Curved is conditioned by one factor: its high price. Buts the team is typical of this format, just offering the power of a laptop and one clear advantage: saving space. Some users may count on it as an absolute priority, but in our opinion, the fundamental benefit of this type of equipment also becomes its ballast. That which boasts spectacular must have a price, but in our opinion, this is too high in the final equation.